I so wanted to get this post in before or during the holidays so as to capture the full effect of the over the river, into the woods, to grandma’s house…with gently falling snow, but I didn’t make it. With any luck there’ll be one more day of snow courtesy of WordPress. I hope you enjoy this nostalgic ride with me in Bourne-Vincent Memorial Park, which forms the core of the Killarney National Park in Ireland. Our ride combines the special serenity of mountains, lakes, woods, and waterfalls, most of which you won’t see due to the limits of my camera prowess. Suffice it to say you just have to have been there! The air is crisp and clean, only a few short hours until dusk. Because it’s what travelers do when they on tour, we have nothing to do but sit back and relax to the clip-clop trot of the horse–for the life of me I cannot remember her name, perhaps Sally (?). It seems to me that one of the reasons we like to get away from our own homes is that it’s so refreshing to be somewhere else where we don’t have to be concerned with the problems that plague the locals in any country. There’s plenty of chance–as you’ll see–to get into that later. A jaunting car isn’t really a car at all. It’s a light, open-air, four-wheeled (sometimes just two) carriage drawn by a single horse. Once upon a time, it was the typical mode of travel for people in Ireland. Today jaunting cars remain, but mostly catering to tourists in some parts of the country. 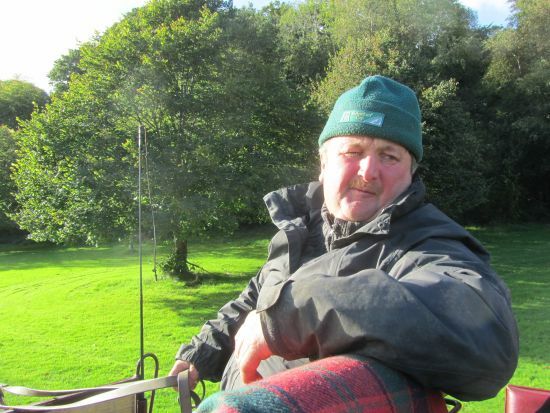 Their drivers are referred to as Jarveys, and they’ve been around since the Victorian age. Always one to wonder what it’s like for the animal in service, I mentally add up a rounded-off figure of 450-500 pounds (I’m being modest 😉 here) this one horse was carting about. While these buggies seem ideally designed for four, there are six in our carriage, plus the driver. Here we are about to enter the Park itself after a quick jaunt through the streets of picturesque Killarney. Hubby and I are sitting just behind the red-plaid blanket thrown over the driver’s box seat. By the end of the ride, that blanket will be cradling the two of us. This is our Jarvey, as they’ve been called since the Victorian age. As I mentioned, it’s close to the end of the day as our tour bus arrived rather late to the hotel. We had only time to check into our rooms before hurrying back out where our jarveys and their horses were waiting, first come-first served. I guess I’ll always wonder how our ride would have been different–more stories, more wit?–had we been a tad faster on our feet. We had been promised witty and well informed jarveys–they were authentically Irish after all. What we got was mumbling and what I noted to be a general lack of enthusiasm, although it could have been language barriers as we soon learned spoken Irish is mostly what we’re used to, but sometimes can sound like another language (more on that in future posts). It could also have been the lateness of the day or plain boredom. I’ve been a docent and I know how boring it can be to tell the same story over and over and over. He certainly looked like he came from central casting, no? 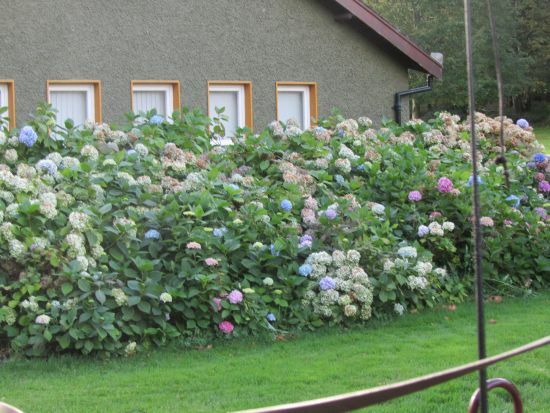 Hydrangeas! I simply cannot resist photographing them since I feel such a strong connection, having grown up with women who tried growing them (myself included) with marked lack of success despite all their efforts. Now I understand why. They need a richer soil than Florida’s shifting sand can offer. Ireland offers so many colors, from blues to pinks, purple, at times almost fiery reds! I think it must be easy when you get a lot of rain as Ireland does. Land for this park was presented to the Irish State in 1932 by Senator Arthur Vincent and his parents-in-law, Mr and Mrs William Bowers Bourn, in memory of his wife–their daughter–Maud. This expanse of land covers about 26,000 acres of mountainous country that includes the highest mountain range in Ireland, the Mcgillycuddy’s Reeks. Here we’ll have glimpses of the three major lakes (Leane, Muchross or Middle, and Upper) of Killarney. Passing by waters like this always takes me back to cane pole fishing taught me by my grandparents, all of whom had connections with Ireland, Scotland or England. They would have loved fishing here, and it isn’t difficult at all to imagine them here. Can’t you just sense a school of trout just waiting patiently in the water here? 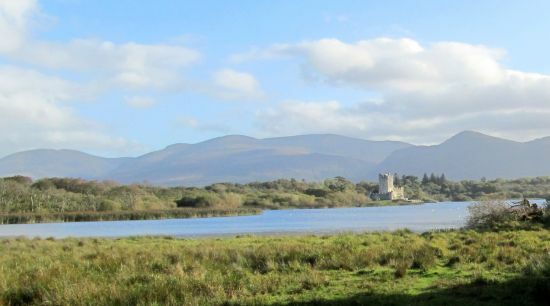 Below is a distant look at one of the three lakes, the Lough Leane, (or the Lower Lake, Lough is Irish for Lake). That structure to the right is the Ross Castle, which I learned not from our unenthusiastic jarvey but from Wikipedia. According to them, the castle is typical of strongholds of Irish chieftains built during the Middle Ages. The tower house had square bartizans on diagonally opposite corners and a thick end wall, and was originally surrounded by a square defending wall with towers on each end. Historically this castle was a stronghold in defense against Cromwellian forces and even though the owners lost it for a period, they were able to retain rights to it until 1620 by showing that their heir was too young to have taken part in the rebellion. They erected a mansion house near the castle, and eventually their adherence to James II of England caused them to be exiled. The castle then became a military barracks, and remained as such until early in the 19th century. We pass many animals along the way, including herds of native red deer, unique in Ireland, present in the country since the last Ice Age. While I was able to capture some quick snaps, none were of sufficient quality to post. Somewhere near the end of our jaunting experience, a member of our group inquired about the lack of horse dung on the roads around the trails. 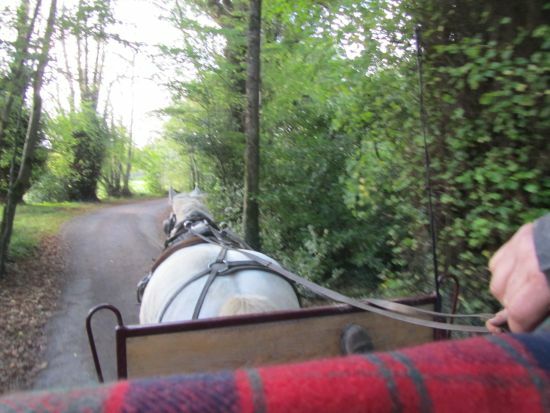 The air was surprisingly pristine, not at all what you’d expect with 66 horse-drawn jaunting cars, according to Ireland’s National Park & Wildlife Service. Except for an occasional fart or two from our horse I’ll call Sally, the air and the streets were sweet and clean. It seems the NPWS has jurisdiction over the internal roadway within the National Park and as of have now introduced regulations that an equine sanitary device has to be fitted to use these routes and keep the park free of manure. You might think of them as horse nappies–or as we say in the U.S.–diapers. It’s a long story, really, beginning in 2009. It was a long arduous argument between the jaunting services and the NPWS, something akin to the ongoing diatribe between the U.S. Republicans and Democrats, divided somewhere along the middle if you were to read the online diatribes between the locals. As an outsider, I have to say I can appreciate how disgusting 66 horses trotting about day in and day out, added to any animal’s tendency to poop where and whenever they feel the urge, combined with day in day out drizzling rain drizzle could put a downside to a tourist industry, let alone the locals who use the park for walking, bike riding, picnicking, etc. In July 2009, jaunting cars were banned from entering the park. Finally the jaunting services relented, agreeing to try the dung catching devices they had insisted would spook and cause havoc for the horses on a trial basis. Apparently things went smoothly as they were allowed to re-enter the park in May 2010 after nine months! I just know that, like me, my readers would be curious as to what a dung catcher would look like, so there it is–you can see the basket like contraption there just below the horse’s tail about mid-leg, ending just above the wheel. The weather gods are with us this day. As we are delivered to our hotel with just enough time to shower and change for a dining in the round experience, the sky is overcast and there’s a drizzle in the chilly air. In spite of the jarvey’s seeming lack of interest in doing more than answering specific questions, he responds to our more personal queries. Have you ever visited the U.S.? (Yes, Massachusets, last fall. He’ll be returning there later in the year.) Charming is still the best way to sum up our jaunt in the park, since I’ve forgiven the jarvey his lack of enthusiasm, and I wouldn’t change a thing. This entry was posted in Animals (are people too), International Travel by Alice. Bookmark the permalink. I suppose it becomes like driving a bus, but for the fact that the jarvey is out in all weathers, taking the same route several times a day and answering the same questions over and over. I hope the scenery made up for his lack of enthusiasm. May 2012 be a healthy and interesting one for you and hubby. Oh yes, GM, I’d forgiven the poor man by the time we were back at the hotel…as mentioned, I’ve been in similarly fitting shoes before and I do understand. The scenery was spectacular, as were the animals and fowl as well! A Happy and a healthy New Year! How I envy you such fun!!!!! You are really blessed!!!! The travesty would be if I didn’t realize how lucky I am, Kay. Lucky for me, I do know! ‘Wish it were so for everybody. Happy and healthy new year, to you and hubby. Have you tried the horse and carriage ride in Central Park? Looks like fun. Thanks Ruthe! It’s started out well with good food and cheer. I haven’t tried the carriage ride in Central Park because I’ve always felt so sorry for the horses there. I’m not sure how well some are cared for. (I’ve heard stories!) Maybe I’ll feel differently someday. Aunty, I loved the post and the two pictures of waterside particularly. Both the photos are so strikingly similar to ones I took recently on a trip to Pench National Park, the scene of Rudyard Kipling’s Jungle Book.